2D Intersection plot Tool: Cut View. You can visualize 2D intersection of the 3D surface and X, Y orthogonal cut plane (also called slicer). The position of the intersection is controlled by moving Cut Tool in 3D window (Mouse Drag Anchors to move semi-transparent plane). The current position of the Cut Tool is displayed at the buttom of the form within status bar. Form is autoresized and and positioned. Last applied size and position is saved for the next use. 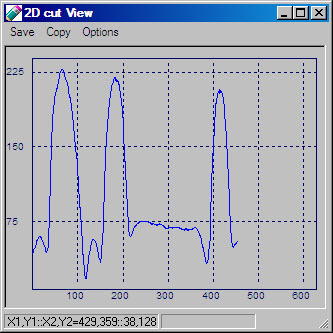 NB Note that 2D cut plot is taken from originally measured/loaded beam image. 3D compression do not affect this plot.